This great inlaid frame is the perfect decorative accent for your favourite prints or personal photos. 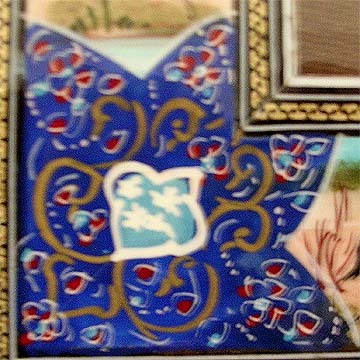 It features an intricate design that is known as esleemee in Persian. There is no exact English translation, but mosaic is close. 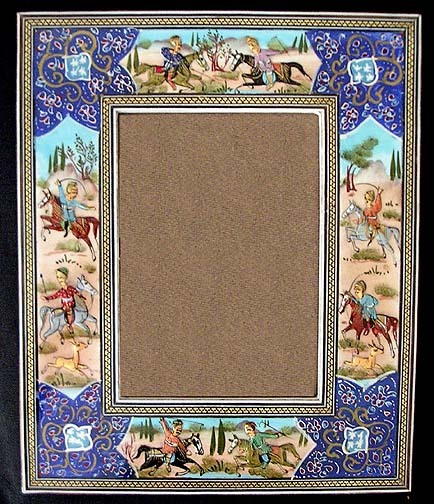 It also features embossed, hand-painted nomad horsemen. There is khatam inlay on the edges and the sides of the frame. The back is varnished wood. There is an easel and an eyelet on the back so it can be displayed on a wall or desktop. This may be especially nice for photos of newborns and young children.